Part of our plan for keeping bees moving forward is based on using horizontal hives. We will use top bar hives primarily but also want to keep framed hives so that we can produce nucs and sell bees. 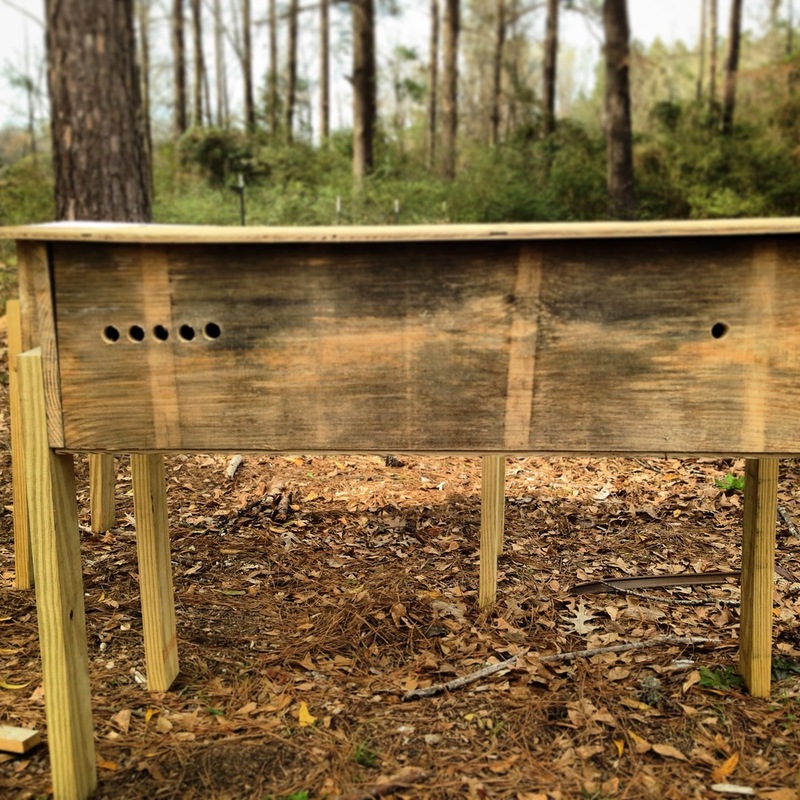 We used plans for a horizontal deep hive from Horizontal Hive. It holds 31 Langstroth deep frames. We will manage the hives in a very similar way to the top bar hives. 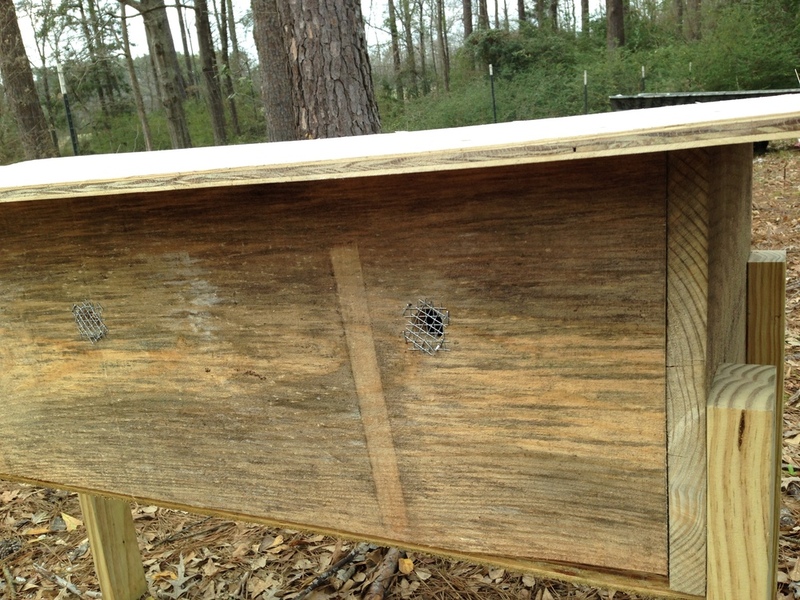 We made entrances by cutting 5) 1" holes on the left side of the hive about midway up. These will be the main entrance of the hive. 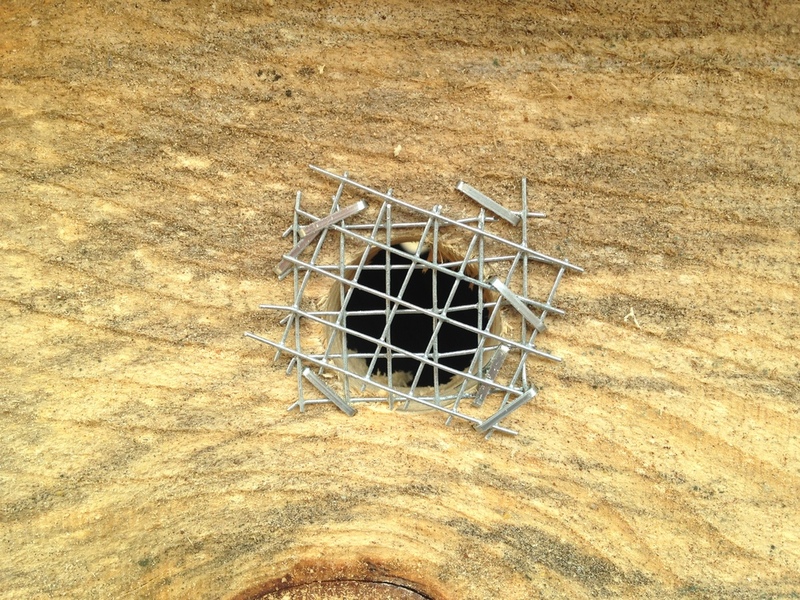 There is another hole on the right side of the hive that will be opened up during the main flow when the bees are bringing in lots of nectar. I have seen similar ideas in vertical hives by adding an upper entrance during the main flow. On the back side of the hive are 3) 1" holes covered in hardware cloth that will be opened for ventilation during the hottest times of the summer. The roof is a single sheet of 1/2" plywood. We may add hinges at a later time. Under the roof will be a long piece of burlap made from old coffee bean bags. We'll stiffen the burlap with a mix of flour and water. This will allow us to only expose the frame or frames that need to be worked and not disturb the other frames and bees. In the top bar hives I've managed, this has made the bees much less agitated and aggravated. The current plan is to move already boxed hives into these new horizontal hives. We will make a video of us doing this and take some pictures as well. Then we will also write another entry covering that process and how it goes. I first read Thoreau's Walden in the 10th grade. I didn't know it then, but it would have a profound impact on my outlook towards life and what it means to be successful. It took years to absorb that book and I still try to reread it once a year to continue gaining more insight from it. One of my favorite aspects of the book and Thoreau's approach is to simplify life as much as possible. Cutting out distractions helps one be able to live more intentionally and fully in the moment. As with most things in life, simple doesn't always mean easy and to simplify one's life in this time can be difficult and met with resistance from every direction. When I decided that I wanted to be a full time beekeeper, I saw a way of making a living that could help me transition to a simpler lifestyle. After getting my first hive I knew I wanted to keep bees as "naturally" as I could and I thought that keeping bees in general seemed fairly simple. Ah! Ignorance is bliss! I didn't realize how difficult and complex keeping bees could possibly turn out to be. If someone goes the "conventional" route of beekeeping it can become quite complex and costly. The experts and books will present beekeeping as a complex routine of treatments, medications, manipulations and techniques to coerce the bees into being productive. I went this way, minus hard chemical treatments, myself. And the whole time, I thought there must be a simpler way to keep bees. Most modern beekeeping runs under the assumption that without beekeepers and our constant diligence, the honey bee will cease to exist. I find that hard to believe and actually have come to the conclusion that the honey bee continues to survive in spite of what beekeepers continue doing. It is a true testament to the versatility, adaptability and the innate wisdom of the honey bee. It cannot be true that all of the artificial tactics of the modern beekeeper are necessary for bees to continue to prosper. Humans have kept bees, which in itself no matter how hands off the approach is not truly natural, for thousands of years. For most of that time, the methods of keeping bees were very basic and usually resulted in killing the entire hive to harvest the honey. Beekeepers made more hives by allowing some of them to swarm. The modern approach to beekeeping is credited to Langstroth and his framed hives, which allowed for an easily removed and inspected comb. Of course, he borrowed ideas form people before him such as Huber but I won't dive into the history of apiculture. I only bring up this point to demonstrate that the modern methods of beekeeping are still relatively new and while there are many advantages to keeping bees this way, they are not the only ways to keep bees successfully. Most of the new "innovations" in beekeeping since the mid-19th century have really focused on making life easier for beekeepers, not bees. After keeping bees in these industrial friendly ways for a generation or two, diseases started appearing. Isle of Wight disease decimated bee populations in the late 19th and early 20th century. The 20th century seemed to have waves of disease and pests going through apiaries. Nosema, tracheal mites, American and European foulbrood, the dreaded Varroa mite and small hive beetles have all occurred in greater numbers since the invention and widespread use of industrial beekeeping. Along with these pests have come the widespread use of antibiotics and pesticides in hives. These chemicals are almost all lipophilic, and beeswax being a lipid based substance has absorbed these chemicals and allowed a build up of chemical residues in our beehives. This is compounded by the beekeeper's desire to keep reusing the same combs over and over because it causes the bees to be more productive and easily split. In nature, bees will abandon combs after a time because each generation of larva and pupa that go through them leave excrement and waste behind that also builds up in the combs. The bees don't want to keep on using these old combs because they are great carriers of disease and viruses. On top of the "hardware" methods and techniques of modern beekeeping, there is the shallow gene pool of modern beekeeping. To maintain pure breeding lines for certain behavioral traits such as docility, fecundity and honey production, queen breeders have resorted to artificial insemination and the vast majority of queens are produced from only a handful of queen breeders. There is also a strong belief in preventing the natural instinct of swarming. Swarming is the natural way that beehives divide and multiply and most beekeepers now make artificial splits and add unrelated queens, which causes a whole other set of problems to be dealt with. I know this all seems very technical and wordy. And it is. It is increasingly complex and far from natural and that is why I started looking for simpler ways of keeping bees. I have more trust in the bees and their own abilities to live and solve problems than I do in our ability to comprehend the natural balance of microflora, pH levels and the other beautiful intricacies that 150 million years of evolution have created. It became increasingly apparent to me that I wanted to help my bees return to a more natural state of being and living. I think that by allowing the bees to regulate themselves they will adapt to pests and diseases in the ways that best serve them. I may not produce the quantity of honey or bees that can be made through more manipulations and treatments, but I am confident that the bees and honey I do produce will be the healthiest and highest quality. I started by reading a biology textbook of the honey bee. That changed my approach to bees and has been the single most important piece of knowledge that I have gained. So, how do I keep bees and plan to move forward? I am moving to horizontal hive designs. This allows me to check single frames or bars of bees without disturbing the rest of the hive at the same time. I also don't have to completely tear a hive apart to look into it. I will be using horizontal framed hives and top bar hives. I'm promoting the swarming of my hives and split them just prior to the swarm actually leaving. This is tricky and I'm sure I will not catch all of them. This will allow me to put related queens and bees into new hives and locations. For instances when queens are needed in an emergency or for some other reason, I am using the Hopkins method of queen rearing with a Cloake board. There will be an entire post covering the way I am doing this. I harvest the entire comb with the honey. This allows me to remove older combs and promote the drawing out of fresh new comb in the hive. I will also have a separate post on this topic. I will trust the bees to handle and adapt to pests and diseases. Yes, I will lose bees in the process, but the surviving bees will produce a stronger and more locally adapted bee that will require no chemicals. Over time I will selectively breed for traits that are desirable by open mating and following similar methods of Brother Adam of Buckfast Abbey. Thank you for taking the time to read all of this. I know it seems like a lot of information but it's necessary to understand the reason behind my approach. I welcome all questions, comments and suggestions.